Infertility. If you haven’t experienced it yourself, you certainly know someone that has. Literally millions of Americans struggle with it, which is absolutely wild. 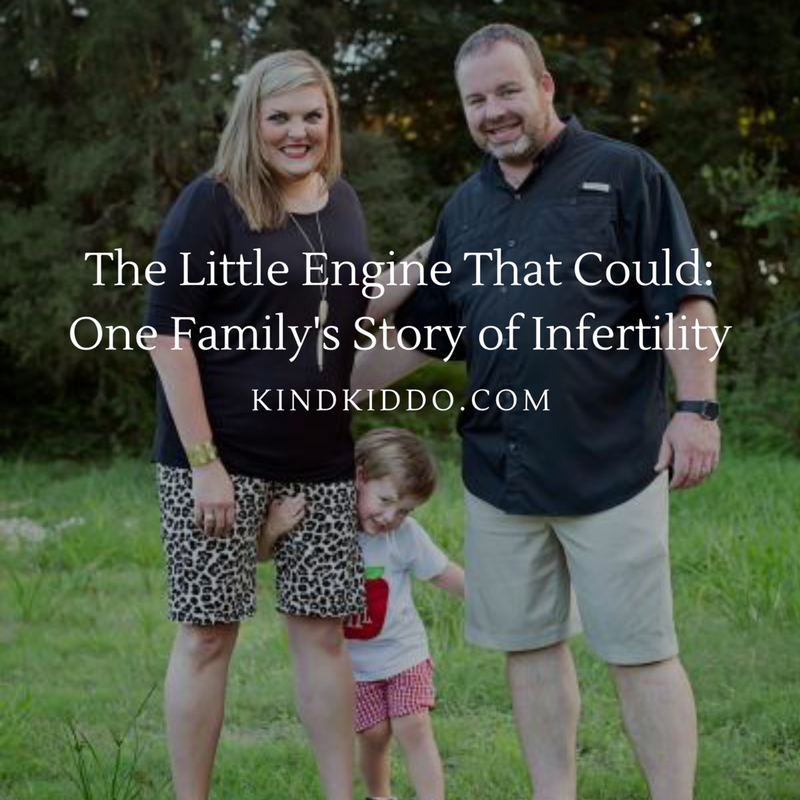 Because I have not struggled with infertility myself, I wanted to reach out and help share someone else’s story. So just as I have in the past with Kind Kiddo Real Families stories, I again, turned to someone I know personally (a friend since preschool), to gain some insight. Brandyn and David Hargrove married in April of 2004 in their hometown in Texas. Blissfully happy and in love, they began their journey toward parenthood just months after their wedding. Being parents was important to them both. That, they knew without a doubt. What they didn’t know is that this seemingly simple dream would lead them down an 8 year long twisting path of hurt and loss. But in the end, their dream finally came true with their “little engine that could”, and Brandyn agreed to share some of the details of their story with Kind Kiddo. KK: Have you and your husband, David, always wanted to be parents? KK: That’s precious! Okay, so when you started trying to get pregnant, were you surprised that it wasn’t happening quickly? How long did you try on your own before deciding to see a specialist? BH: When we first started trying to get pregnant, I was surprised that it was taking a while, but I wasn’t, too. My family has a history of infertility issues. My mom got pregnant with me no problem (I was an oops! ), but it took her 8 years and 11 months before she brought my sister home from the hospital. David also has some health issues that he was born with that we knew could be a factor. I don’t remember exact dates (I wish I’d written it all down), but I think we first went to a specialist about a year after we officially started trying – so early 2006. We actually started by going to a doctor for David, a urologist. We thought he would be our best bet because of issues David had at birth. After four intrauterine inseminations at his office and still no pregnancy, they suggested I see a specialist. We went to a Houston doctor that will remain nameless. He didn’t work for us, didn’t seem to listen to us, and made us feel like a number. I had four more IUIs at his office before having an exploratory laparoscopic surgery in which nothing was found. We did three more IUIs after that. I ended up starting my period on the first day of school with the last IUI. If you know anything about infertility treatments, you know your life is not your own. You go by the timeline set by mother nature and the doctor. We decided to take a break because I couldn’t miss the first week of school, and frankly, I was exhausted and so was our bank account as our insurance doesn’t cover infertility treatments. We ended up taking a year off and then returned to a different doctor, Dr. Vicki Schnell at the Center of Reproductive Medicine in Webster. This woman is amazing. With the help of our Lord and Savior, she is the reason why we are parents. We immediately started a round of in vitro fertilization or IVF. And guess what?! I got pregnant! Twin boys. But at 8 weeks, I started bleeding. I went on bed rest for 6 weeks, ended up in the hospital after passing a huge blood clot at 13 weeks, was released to go home seemingly fine, and then I miscarried both boys 2 days later at 14 weeks. We underwent genetic testing and found that we both were carriers of a genetic mutation called MTHFR (I joke that it looks like a cuss word abbreviated). Because we both have this mutation, the baby would, too. Basically, it’s a blood disorder that causes clotting, and the clots fight off anything that seems to be alien in my body. Translate alien to embryo, and you understand why I miscarry. We started another round of IVF and got two embryos. We implanted one and froze one. I got pregnant! And then I miscarried again. We did the frozen embryo transplant, and I got pregnant! And then I miscarried again. At this point, we started looking into adoption. After an informational session, I told David that if we’re going to pay $20,000 for a baby that is not biologically ours, then I wanted to pay $20,000 one more time and do IVF again. This time around, I gave it all to God. I spoke positively over the entire situation. I believed that I would get pregnant… and I did. We retrieved ONE egg with this round. That one egg turned into one embryo turned into one Carter, our Little Engine That Could. Thank God for him! He made it all worth it and continues to make it all worth it every single day. I am SO thankful that I never gave up. When you reach the end of your rope, you can either tie a knot and hang on, or jump off. I’m so glad we decided to hang on! KK: Wow! Yes! Thank God you hung on! What were some of the most difficult parts of your long infertility struggle? BH: In addition to the financial, emotional, and physical struggles in our infertility journey, there was the friendship struggle. I had to watch as all my friends got pregnant… and I had to be happy for them. I’d like to say that I rose to the occasion and went to baby showers and celebrated with them, but that wasn’t the case. I was young and stupid and only thinking of myself. Now don’t get me wrong, I was happy for them. I wouldn’t wish my journey on my worst enemy, let alone my friends. I just wanted them to relate to me, and they couldn’t. I wanted them to just come and lay in the bed with me and cry when I miscarried, but they didn’t. I should have spoken up and told them this, but I didn’t. Instead, I held grudges and became a bitter ball of hate that even I didn’t want to be around. I think that’s the most difficult part of this struggle – the friendships I lost. If only life had redos… But they know who they are. If they read this, I hope they know that I love them and miss them every day. KK: What is the most important message you want to spread in regards to infertility? BH: If you are struggling with infertility, don’t give up. God has a plan. You may not see or understand that plan right now, but there is an end in sight. Tie a knot in your rope and hang on. NEVER EVER GIVE UP. God works all things out for good for those that love and believe in Him. I firmly believe that, especially now. If you’d like for me to pray for you or if you need someone to listen, reach out to me! I want to use our experience to help others. KK: How about some practical advice on the whole thing? BH: The most practical advice I can give someone struggling with infertility is to communicate with your spouse. It may sometimes feel like you are in this alone because men tend to react and cope differently than women. They feel like they have to be strong. You both need to talk to each other, or you’re just going to start resenting each other. Thankfully, I married a guy that talked to me, and this whole experience made us closer. Also, I think you need to keep an open mind about the whole situation. I went into the first round of IVF thinking that it would all go smoothly. It didn’t! My body wasn’t responding appropriately to the meds they had me on, so they canceled that round in order to figure out what they needed to do to make my body react more appropriately. I was devastated! Hindsight, it was a small hiccup in a HUGE and very long struggle. I eventually adopted the saying, “It is what it is” because I can’t control what happens, only God and the doctor can. I think that’s what helped me the last round in which we got Carter. And vodka cures everything. HA! Just kidding… no, but really. If something doesn’t go the way it’s supposed to, you need to take a day, or night, or weekend even to get away from it all! You have to have moments where you relax and release. What you are going through is so incredibly stressful on you mentally, physically, financially, etc. Take the time to remember who you are and that infertility does not define you or your spouse. Stay connected to each other, remember why you love each other, and keep a positive outlook! As I said earlier, God works all things out for good for those that trust Him! Brandyn and David live in the same hometown they both grew up in with their adorable son, Carter. Brandyn is not only an 11th grade English teacher, but also the English Department Chair, a cheer coach, AND she sells Younique. David is Chief of Operations for an HVAC company and serves on the council for a local HVAC company which was just named a National Top 20 Contractor for an HVAC manufacturer . He also serves on a dealer council for a Southern U.S. HVAC distribution company. And both Brandyn and David are on the board for their local school district’s Education Foundation. Busy – and very happy – parents! This is an excellent article, Britney! Grateful for Brandyn’s heart to share her story and encourage others! Thank you so much for reading, Deanna. Brandyn is an excellent English teacher and her answers were 100% written by her. She made it easy for me! 😉 I hope her story helps to inspire someone out there that needs hope. Enjoyed their story. We had infertility issues back in the 70’s. We chose to be parents rather than give birth. I had wonderful friends who were caring. In fact , Britney, your Mother was right across the street. Remember to always be kind to those who infertility issues.